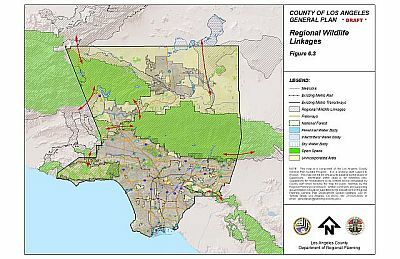 The proposed Significant Ecological Areas (SEAs) play a critical role, not only in identifying Los Angeles County’s biotic diversity, but in providing an opportunity to connect these areas with similar areas of biological importance in adjacent counties. The Puente Hills SEA identifies a regionally significant open space that connects the Puente Hills in Los Angeles County with the Chino Hills in Orange County, which is connected to the Santa Ana Mountains, and further south, the San Jacinto massif, in San Diego County. Similarly, the Santa Monica Mountains, Santa Susana-Semi Hills, Santa Clara River and Santa Felicia SEAs all identify important connections to habitat in Ventura County. The San Andreas SEA identifies the regionally significant connection between the San Gabriel Mountains and the Tehachapi Mountains, which is also an area where the boundaries of three ecoregions intersect. The Antelope Valley SEA, identifies connections between the San Gabriel Mountains and the Mojave Desert, which provides movement opportunities along the drainages, such as Big Rock Creek, and into vast open areas in Kern and San Bernardino Counties. The SEA also identifies the south-western portion of Desert tortoise habitat, part of larger habitat area within San Bernardino and Kern Counties. Evidence of significant wildlife movement throughout the Puente Hills SEA has been documented in a two year carnivore study commissioned by the Santa Monica Mountains Conservancy as part of a multi-jurisdictional effort to establish a region wide wildlife movement linkage. This SEA represents the Los Angeles County portion of a continuous series of natural open space within the Puente Hills and Chino Hills. Overall, this open space extends north and west from State Route 91 (SR91) in Orange and Riverside Counties to the Whittier Narrows reach of the San Gabriel River. The Puente/Chino Hills are a natural, physical link between the Santa Ana Mountains and the San Gabriel River. The San Gabriel River flows from and links to the San Gabriel Mountains. By virtue of these linkages and a complex of interconnected habitat units throughout the Hills, the Puente/Chino Hills function as both an important wildlife linkage and resident habitat area for regional wildlife populations. Although wildlife movement is hampered by rural development in the SEA, animals are still able to move through the Santa Monica Mountains in many areas. Due to its large size and topographic complexity, many linkages are certain to occur within the SEA at various bottlenecks. These linkages allow movement between large open space areas within the SEA as well as between areas outside the SEA such as the Simi Hills and the western extent of the Santa Monica Mountains in Ventura County. The genetic flow through these areas is crucial in maintaining the diversity and viability of certain species within the Santa Monica Mountains. 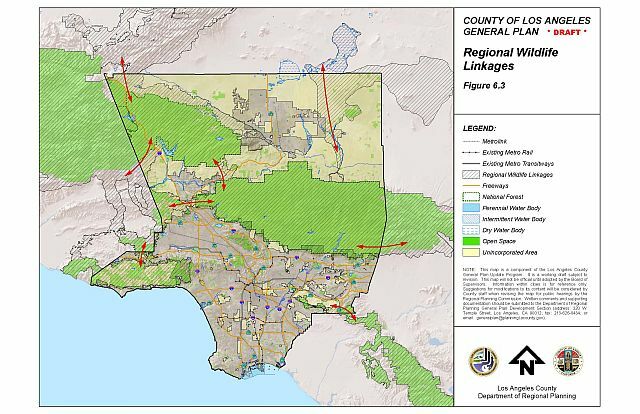 Open space linkages between Kanan Road and Calabasas Parkway along Highway 101, as indicated by the National Park Service, are of particular importance for continued wildlife movement, due to the lack of alternative routes and encroachment of development. Although there are significantly large open spaces within the SEA, contiguous habitat linkages between them is critical in reducing bottlenecks and providing for long- term sustainability. The Santa Susana Mountains/Simi Hills SEA includes several important linkages for wildlife movement. The Simi Hills and Santa Susana Mountains are part of a vast open space that fosters wildlife movement between the Santa Monica Mountains to the south, San Gabriel Mountains to the east, and Los Padres National Forest to the north. Dense, natural habitat associated with the majority of the SEA provides excellent opportunities for concealment and water sources while the grasslands provide an abundance of prey. Historically the riparian corridor along the Santa Clara River has served as the primary east-west linkage between the Pacific coastline, coast ranges, interior ranges, high desert and southern Sierra (via the Transverse and Tehachapi range). Animals moving through the Santa Clara River at one time had unobstructed passage along the river and within its tributaries. The present configuration of the tributary drainages has reduced connectivity from the Santa Clarita Valley to the north, but the Santa Clara River remains relatively intact and open. The SEA embraces the river corridor and the linkage zones considered essential to insuring connectivity and resource values within the historic movement zones for all of the wildlife species present within the Los Angeles County portion of the Santa Clara River. Historically, riparian corridors have served as linkages between the Pacific coastline, Coast Ranges, interior ranges, the high desert and southern Sierras (via the Tehachapi range). The Santa Felicia stream corridor likely serves the functions today. The elevation in this area is lower than that of the Los Padres National Forest, to the north, which facilitates animal movement within the riparian systems between Piru Lake in Ventura County and the San Gabriel Mountain range in Los Angeles County and beyond. The tributary drainages for Santa Felicia Creek within this SEA remain intact and unobstructed. The San Andreas SEA includes several important linkages for wildlife movement. The Fault Zone connects with the Santa Clara River drainage in the Lake Hughes area, linking with this large, free-flowing watershed that extends to the Pacific Ocean in Ventura County. The foothills and grassland in the westernmost segment of the SEA are part of an important linkage between the San Gabriel Mountains and the Tehachapi Mountains. This linkage to the Tehachapi Mountains is important because it connects the southernmost extent of the Sierra Nevada Mountains with the San Gabriel Mountains and with the southern Coast Ranges. The Tehachapi Mountains are the only mountain linkage between the Transverse Ranges and the southern Coast Ranges to the Sierra Nevada Range. This largely natural area is an important topographic reference for migrating birds and bats, functioning as essential high elevation foraging grounds along their migration route. The Tehachapi Mountains further provide a valuable link for gene flow between divergent populations of many species, including plants. The SEA includes several large drainages that extend from the San Gabriel and Tehachapi Mountains to the western end of the Mojave Desert, flowing toward the Antelope Valley floor. These washes provide an important linkage for animals traveling between the mountains (all the ranges mentioned above) and the Mojave Desert. In addition, the sag ponds along the San Andreas fault zone and Amargosa Creek facilitates east-west wildlife movement through Liebre Mountain, Portal Ridge, and Ritter Ridge to Barrel Springs in the Antelope Valley near Palmdale. The frequency of valuable riparian communities along this travel route located within an otherwise arid climate, further indicates the importance of this area, which is one of the busiest natural wildlife linkages in the region. The SEA extends from the Angeles National Forest to the playa lakes within Edwards AFB, encompassing the whole of the two largest drainages exiting the northern slope of the San Gabriel Mountain range, and its geographical features serve as a major habitat linkage and movement corridor for all wildlife species within its vicinity. Ecologically “generalist” species have the ability to move across such vast areas and through changing habitat types. For such species, the SEA may serve as an important system for long-term inter-populational genetic exchange. For smaller or less-mobile species, or taxa which are more narrowly restricted in their habitat needs, the SEA can serve as a broad linkage zone, in which individual movement can take place during seasonal or populational dispersal. This provides essential genetic exchange within and between metapopulations. The two drainages, combined with the upland terrestrial desert-montane transect portion of the SEA, insure linkage values and direct movement zones for all of the wildlife species present within the Los Angeles County portion of the Antelope Valley.